Steve Bannon and Stephen Miller’s Muslim ban is about white nationalism. Why Bother With “Coup” Conspiracy Theories? The Muslim Ban’s Racist Goals Are Right in Front of Us. 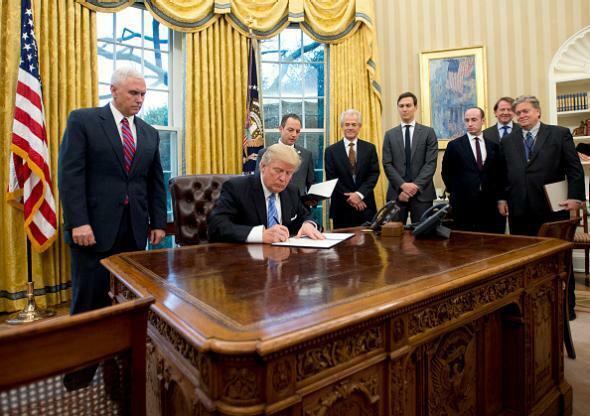 Donald Trump signs several executive orders on Jan. 23 in the Oval Office. Stephen Miller is third from the right; Steve Bannon is furthest to the right. It speculates that green card holders (lawful permanent residents) were initially included in the ban as a ruse to intentionally “create chaos and pull out opposition,” i.e. provoke protests, with the ultimate goal of creating “resistance fatigue” in the general population. (White House chief of staff Reince Priebus said Sunday that the ban would not apply to green cards going forward.) But the early calls for protest against the ban didn’t mention green cards, and a number of the high-profile detentions that initially made headlines involved refugees rather than lawful permanent residents. It asserts both that the Department of Homeland Security (which includes border guards) is being groomed to become Trump’s loyalist personal security force and that some federal departments are being “deliberately hobbled” by orders that are “announced to them only after the fact.” Per the New York Times, though, one of the people that wasn’t told about the ban order until it was signed was John Kelly, Trump’s just-chosen leader of the Department of Homeland Security. It includes a reference to the infamous Christopher Steele dossier’s suggestion that Trump was offered a 19 percent stake in the Russian oil company Rosneft if he could lift sanctions on Russia, then notes that 19 percent of Rosneft was sold a few weeks ago. “The reason this is so interesting is that the dossier said this in July , and the sale didn’t happen until early December ,” writes Yonatan Zunger, the coup theory’s author. But Vladimir Putin announced that 19 percent of Rosneft was for sale in December 2015. It doesn’t demonstrate any special knowledge on the part of Steele or his sources that he was aware of the 19 percent figure. Generally speaking, the coup theory ascribes to 11-dimensional chess that which can be explained by simple incompetence and ideological extremism. Namely, the managerial incompetence of Donald Trump—recall that the only public company Trump ever ran lost money every year he was in charge and went bankrupt twice—and the ideological extremism of Steve Bannon and Stephen Miller, two of Trump’s top lieutenants. We know, in other words, that Trump’s aggressively degrading ban was designed by two men whose worldviews explicitly and implicitly treat nonwhite people—particularly Muslims—as a mass threat to the United States. That’s bad whether or not it’s part of a multiphase power play, and it’s happening right now. Why waste our time worrying about a bigger picture that may or may not exist?